We are manufacturer & exporter of Naticals items & other Indian Handicrafts. Solid copper diver's helmet with an antique finish that gives the look of much use. Brass trim, glass portholes and name plate. Base included. 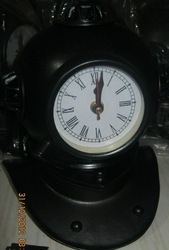 Dimension: 9" x 7-1/2" x 7"
We are engaged in manufacturing & exporting a wide range of Nautical Diving Helmet. 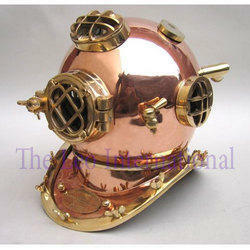 Diving Helmet copper brass wood base-2.5 kg-08 inch. We are one of the leading manufacturers and exporters of DH – 249750. These products are manufactured in our well developed manufacturing unit using high grade raw material that is sourced from our trusted vendors. Our product range is appreciated for its high quality standards, reliable performance and longer service life.